A prototype of the machine should be ready in November at the World Summit on the Information Society (WSIS) in Tunisia. The following year, Massachusetts governor Mitt Romney plans to start buying them for all 500,000 middle and high school pupils in the state. 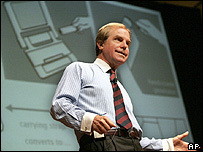 Professor Negroponte predicts there could be 100 million to 150 million shipped every year by 2007. 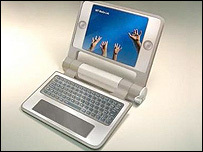 The laptops will be encased in rubber to make them more durable, and their AC adaptors will also act as carrying straps. The Linux-based machines are expected to have a 500MHz processor, with flash memory instead of a hard drive which has more delicate moving parts. They will have four USB ports, and will be able to connect to the net through wi-fi - wireless net technology - and will be able to share data easily. It will also have a dual-mode display so that it can still be used in varying light conditions outside. It will be a colour display, but users will be able to switch easily to monochrome mode so that it can be viewed in bright sunlight, at four times normal resolution. When Professor Negroponte saw the benefits of donated notebook PCs that Cambodian children could carry around with them, he immediately set about planning the sub-$100 machines. The project has some big-name supporters on board, including Google, which is working on thin-client applications. Thin client computing means several machines can share programs when linked up to a central "brain", or server. Making them so cheap would mean that developing nations would be able to afford to bulk-buy them, although Professor Negroponte thinks that even $100 remains too expensive for some. He said he is committed to the idea that children all over the world should be equipped with technology so that they can tap into the educational and communications benefits of the net. Power is a big issue for developing nations in particular when it comes to technology, which is why the hand crank will be fitted to supply extra juice when it is needed. By using innovative technologies, such as electronic ink displays, the MIT team thinks it can reduce power consumption even further on the computers. Such displays require very little power to work. There have been several projects to build and distribute cheap computers for developing nations in order to close the digital divide. A sub-£100 box, called Nivo, has been developed by UK not-for-profit group, Ndiyo. It runs on open source software and works as a thin client. The Simputer has also been developed for developing nations. 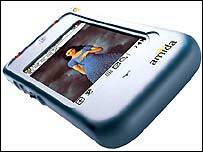 It is a cheap handheld computer designed by Indian scientists.